Welcome to this northern German evening in Dubai. Tomorrow will see the opening of Arab Health, the largest fair for the health and medical industries in the Middle East. I hope all of you will visit the joint stand of the northern German states Hamburg, Schleswig-Holstein and Mecklenburg-Vorpommern in Zabeel Hall. More than 30 companies from northern Germany will be represented at this year's Arab Health. As a port city with a trade history going back centuries, as a metropolis known for its innovation and science, being open, tolerant and strong in international relations, Hamburg has friendly ties with over 180 countries in the world. 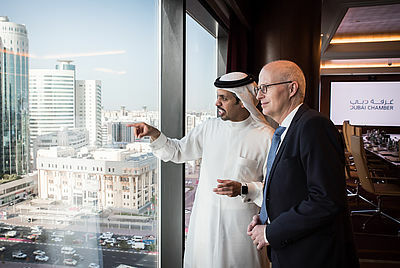 More than 300 companies from Hamburg are currently active in the United Arab Emirates, and 65 of them even have regional offices here. Our city is a major player in the German health industry, with about 6,000 companies, 180,000 employees, and a gross value of about 10 billion Euro a year. The biggest employers are hospitals, with Asklepios clinics in first and the University Hospital Eppendorf UKE in second place. There are several factors that contribute to the strong growth of the healthcare industry: demographic change, the growth of medical knowledge and the technological progress, especially digitization. One of the main topics of both the Arab Health fair and congress will once again be digitization - the chances and opportunities it has for our hospitals and health care system. Before joining the Senate and becoming mayor of Hamburg, I was a doctor at the University Hospital Eppendorf for many years. It was the first hospital in Europe that has implemented a fully electronic patient file. Innovations like digital prescriptions and documentation are not only a matter of having less paper and being more efficient. They are especially reducing the problem of human error. A Closed Loop system, for example, sorts and packs 12,000 individual patient doses daily in a fully automated way - controlled by pharmaceutical and pharmacological experts. Thanks to this we can guarantee the best possible level of medical treatment quality and safety for the patients. Our University Hospital Eppendorf was the first hospital in Europe to be certified as fully digitalized. We are also developing the so-called Digital Health Hub, a network where the health industry, digital service providers, insurance companies, creative agencies and research institutes are all cooperating on preparing new digital tools for the market. Among our partners are Philips Medical, Olympus Medical Systems and Surgical Technologies, global players, all based in Hamburg. Hamburg as a whole is on its way to become a digital city, inventing and using innovative technology and digital structures to improve the standards for our citizens in all areas of life. We are looking forward to start an exchange with the Smart Dubai Initiative in order to tackle such fields as 3D-printing, blockchain, and digital transport. There are many good reasons to visit Hamburg. Apart from attractions like our new concert hall, the Elbphilharmonie, there's the Dubai Hamburg Business Forum, a joint event by the Hamburg and Dubai Chambers of Commerce. Or the ITS World Congress, the leading conference about intelligent mobility which will take place in Hamburg in 2021 and which you are more than welcome to visit. Miss Staab, the Head of the Hamburg Representative Office in Dubai. Ladies and Gentlemen, twice a day, you have the chance to get on a direct flight from Dubai to Hamburg with Emirates. And if you're lucky, you'll be boarding the Airbus A380; the largest passenger aircraft in the world, which - by the way - is finally assembled in Hamburg and from there delivered to Airbus clients in the whole world! So get on board - we will be waiting to welcome you in Hamburg! I wish all of us a pleasant evening and good conversation!